It is with great excitement that we announce that in just a few days the Bubs will be releasing an online-only single with all proceeds to go to the Bubs Foundation. It will be a double-sided single of Right Round and Sweet Caroline and will be available on iTunes starting this Friday, Dec. 3rd. The Bubs are so honored to be in the position to finally give to the Bubs Foundation in a meaningful way. We appreciate all that the Bubs Foundation does and we hope that this release can help the Foundation dream bigger than ever before. Thanks to all on the board (past and present) who have forwarded the Foundation's mission for the past 20 years. We'll post a link to the songs (both here and on Twitter) once they go live, but if they still don't satisfy your Bubs fix (or you want to remember what we sound like live) come to Winter Show on Friday! In the meantime, please join us in drumming up support to benefit this great cause. We are both pleased and sorry to announce that the first batch of online tickets have sold out. If you can't get to the Tufts campus to buy yours in person, come back to this page TOMORROW, November 23rd, at 6:00pm, when we will make 50 more available. SOLD OUT! Sorry if you didn't get yours, but stay tuned for more info or get them at the Campus Center! If you're watching Glee on November 9th, you may notice some familiar voices coming out of some unfamiliar faces. Yes, the Internet rumors are true- the Bubs are providing arrangements and background vocals for Glee's newest group, the Dalton Academy Warblers. The first episode featuring the Warblers will air Tuesday, November 9th at 8/7 central on Fox. For a sneak peek of the song, click here for just the audio or here for the entire scene. Head over to the Concerts Page to check out this semester's schedule and figure out when you can see the Bubs live! Ladies and gentlemen, welcome to the brand new incarnation of bubs.com! Explore the new layout and new pictures, find new ways to connect with the group, and keep checking back for future updates with current information and new features to make it easier to stay up-to-date and share the Bubs with your friends. You can find our most recent albums on iTunes, including our highly acclaimed new album Play The Game (featuring Who Are You, heard in The Who Medley), as well as Pandaemonium, which features Magical Mystery Tour and Come Sail Away. For those of you not keeping up with things in the a cappella world (including us), three tracks off Play The Game have been selected for national compilations! and most recently, Who Are You was selected for BOCA 2010! Woo! 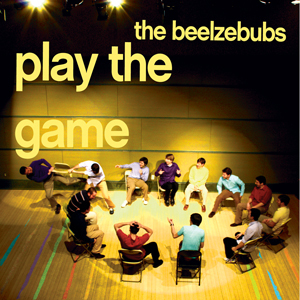 Ladies and gentlemen, the Beelzebubs are extraordinarily proud to present to you our newest album, Play The Game. The culmination of two years of singing, performing, and recording, all the Bubs are thrilled with the result and we hope you'll enjoy it as much as we enjoyed making it. Check out the track list and listen to clips of all the songs or just order your copy now below! The 2010 Contemporary A Cappella Recording Awards (CARAs) have been announced, and the Bubs won three for Play The Game: Best Album, Best Song (for Who Are You), and Best Arrangement (for All The Love In The World)! Congratulations to all the other groups who won or were nominated. The 2010 A Cappella Community Award (ACA) Nominations have been announced, and the Bubs have been nominated in five categories: Favorite Male Collegiate Group, Favorite Collegiate Album, Favorite Male Vocalist (Matt McCormick), Favorite Vocal Percussionist (Alexander Koutzoukis), and Favorite Medley (The Who Medley). If you're already a CASA member go vote for us! If not then go join at casa.org and take advantage of everything a membership has to offer (like free downloads).